Biography of French Gothic Sculptor, Noted For Tomb Sculptures. Franco-Netherlandish sculptor, illuminator, painter and stained glass artist, Beauneveu is best known for the sculptures he created while in the service of King Charles V and John Duke of Berry. Beauneveu's style of Gothic art was naturalistic, and reflective of the Northern Gothic style and the Pucellian revival of the late 14th-century. His best known surviving work is the tombs of Charles V and his family (Abbey of St Denis, 1365). Born in Valenciennes in 1335, little is known of Beauneveu's life or how he learned the art of sculpture - any references to him appear mainly in his patron's accounts. In 1359 he appears in the accounts of the Duchess Yolande de Bar, where Beauneveu is recorded as decorating a chapel in her castle at Nieppe (now destroyed). This is the earliest record of his artistic career. In 1364 he moved to Paris and was employed in the extensive art workshop of King Charles V. Records from this period show that Charles referred to Beauneveu as 'our esteemed Andre Bauneveu our sculptor' - so his worth as an artist was already established. In 1365 Charles commissioned Beauneveu to sculpt 4 marble effigies for the tombs of his grandparents, his father and himself. This was primarily a political commission - the tombs were destined for the Abbey of St Denis, where French kings were traditionally buried. By placing the tombs in the Abbey, Charles was affirming his family's rightful line of succession. The tombs were designed according to traditions of the time: brilliant white 'gisants' (sculptures of the deceased depicted lying down) were created, resting on black marble slabs. Unfortunately the tombs were destroyed in 1793 but drawings from the 17th century show us clearly how they would have looked. However, some of the gisants survived, including that of Charles himself. Charles is depicted lying down, but still alive and his features are finer and better executed than the other gisants. It may very well be that Beauneveu was responsible for the Charles gisant, and his workshop for the remaining. Between 1374 and 1377 Beauneveu was employed on the creation of funerary monument for the Count of Flanders, Louis de Male. For reasons unknown, the project was never completed, but a statue of St Catherine, which was to be part of the supporting structure, survives today at the Church of our Lady in Kortrijk, Belgium. This lifelike figure, with her gently curving pose, naturalistic features and direct gaze, gives a clear sense of the elegance that critics so admired in Beauneveu's art. In order to appreciate important 3-D artists like the Gothic sculptor Andre Beauneveu, see: How to Appreciate Sculpture. For later works, please see: How to Appreciate Modern Sculpture. In 1386, Beauneveu entered the service of one of the greatest patrons of European medieval art - that of John Duke de Berry. Beauneveu was employed as Berry's superintendent, responsible for overseeing all paintings and sculptures. He was particularly involved with the decoration of the Duke's fairytale castle Mehun-sur-Yevre in Cher, France. The castle is an excellent example of International Gothic and early Renaissance architecture. The only surviving sculptural fragment from the castle is that of a large bearded head (now is the Louvre Museum). It probably belonged to one of the twelve apostles that would have stood against the pillars inside the castle's chapel. It has been suggested that the head is the work of Jean de Cambrai, Beauneveu's successor, but this is generally rejected. The stained glass art and other decorative art works at Mehun were so highly regarded by his contemporaries that the Duke's brother, Philip of Burgundy, sent his own court artists (Claus Sluter and Jean de Beaumetz) to study it. Beauneveu was also involved with the stained glass and sculptural ornamentation of the Duke's palace in Bourges. Several figurines from Bourges still survive today and are scattered among private and public collections. The styles within the collection vary, which reminds us, that northern European sculpture of this period was generally a team job. The artist would dictate and set the standard, but his apprentices would carry out the craft work. For developments in Italy, see: Italian Renaissance Sculpture. Beauneveu's skills did not stop at sculpture - he was also a fine artist and produced illuminated manuscripts and fine art paintings. He created a series of 24 page miniature manuscripts, and decorated them with pictures of prophets and apostles. The figures are painted in grisaille and the angle they are depicted shows Beauneveu had a keen interest in realistic 3-D modelling and foreshortening techniques. Documents from the time also indicate that Beauneveu was accepting commissions for paintings and panel paintings - although none of these appear to have survived today. In the early part of the 20th century some paintings were suddenly accredited to Beauneveu, but these have been subsequently dismissed on the basis of careful scholarship. The only large scale 'paintings' that can be safely attributed to Beauneveu, are his stain glass windows. 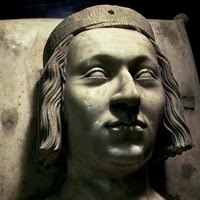 There are no documental references to Beauneveu after 1398, but it is generally assumed he died in 1400.